All pages of the application form completed and signed. - One of the photos should be certified and signed by your guarantor. - The photographic paper must be of high quality with a matte, rather than a glossy, finish. Go to an expert photographer who knows what he/she is doing. Faulty photos are a major reason for application rejections. Save time get your pics right. 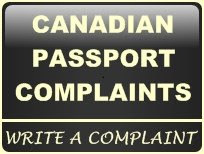 Any Canadian passport or travel document issued to you within the last Five years. Documents to support identity which must be valid, must be issued by a federal, provincial, territorial or municipal authority in CAN, or local euivalent, and must include the bearer's name & signature. The fee (of course the Govt wants your money). Processing time can be 3 weeks from the date of submission of completed applications. So be prepared, apply in advance, just in case you make a mistake and it takes longer. You can also renew your Canadian Passport by Simplified Passport Renewal Process.